In this tutorial, you'll learn how to make the most of ggplots facetting functions. With facetting, you can make multi-panel plots and control how the scales of one panel relate to the scales of another. 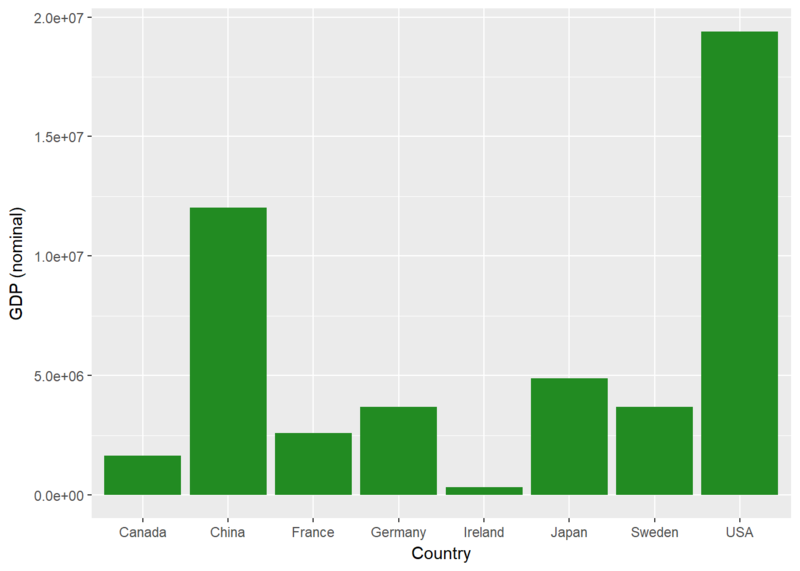 If you're at all familiar with ggplot, you'll know the basic structure of a call to the ggplot() function. 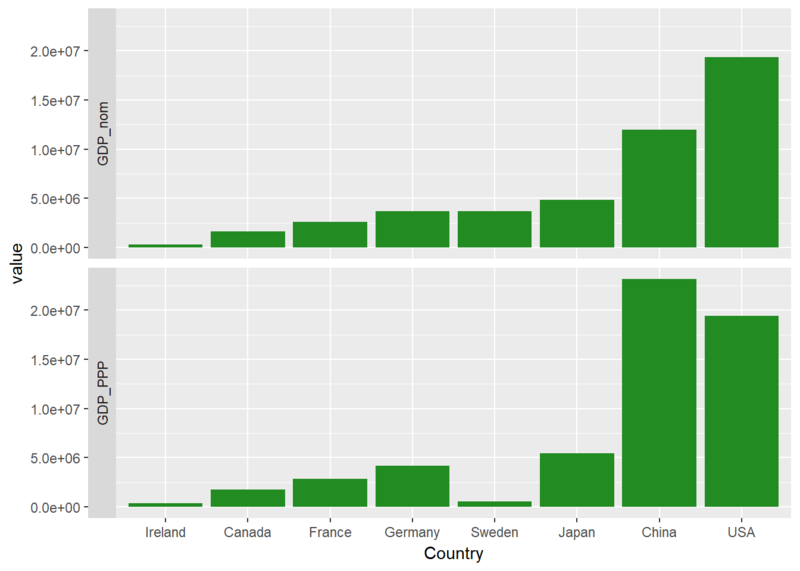 For an introduction to ggplot, you can check out the DataCamp ggplot course here. When you call ggplot, you provide a data source, usually a data frame, then ask ggplot to map different variables in our data source to different aesthetics, like position of the x or y-axes or color of our points or bars. With facets, you gain an additional way to map the variables. To demonstrate this, you'll make use of the following dataset, which includes a number of economic indicators for a selection of countries. Most of these are variants on GDP, the Gross Domestic Product of each country. GNI_per_capita: Gross National Income for each country on a per capita basis. Region: region of the world where the country is located. 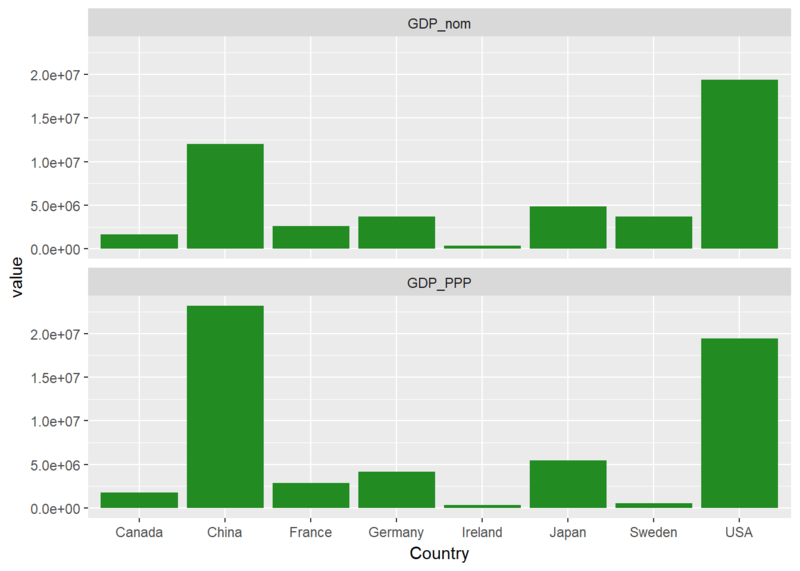 To start with, let's make a simple barplot of the nominal GDP of each country. 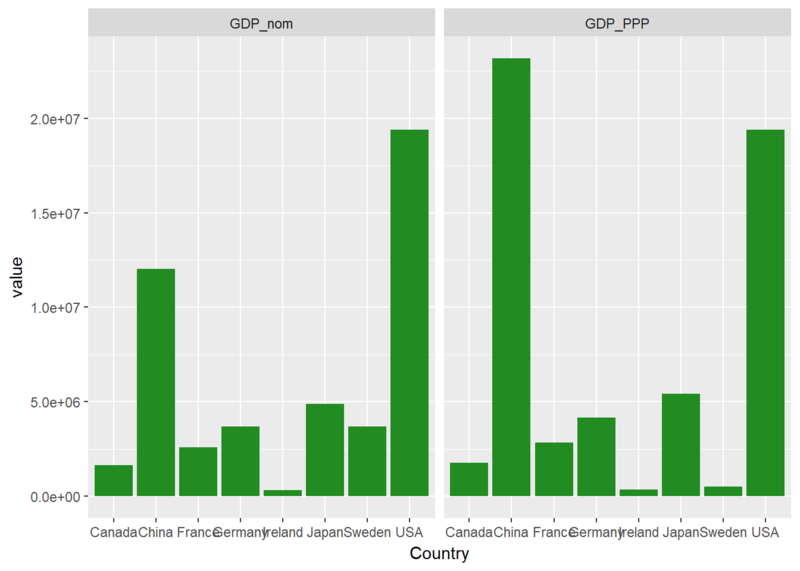 You can also plot another variable, the PPP-adjusted GDP. This gives you a second separate graph, similar to the last but making use of a different variable. Let's say you want to plot both GDP (nominal) and GDP (PPP) together. You'll use facetting to do so. First, you'll need to reformat your data, changing it from a "wide" format with each variable in its own column to a "long" format, where you use one column for your measures and another for a key variable telling us which measure we use in each row. Once you have the data in such a format, you can then make use of our key variable in order to plot with facets. 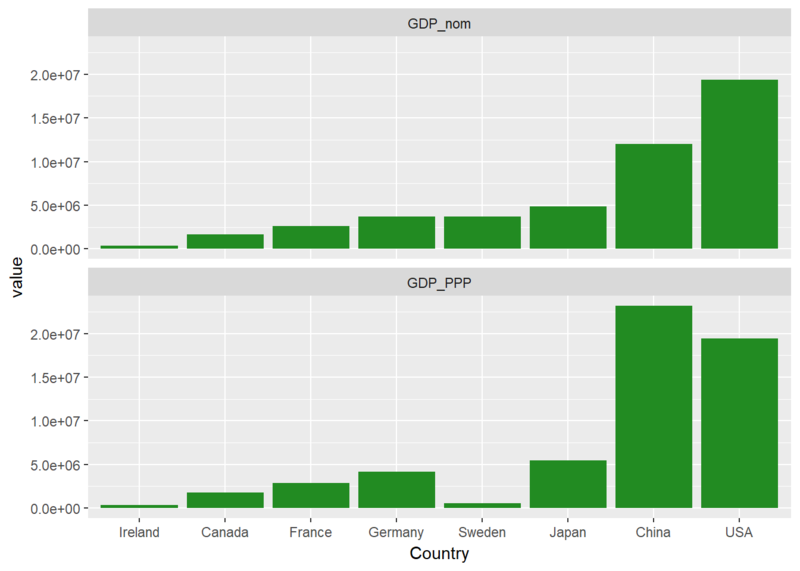 Let's build a simple plot, showing both nominal GDP (from our first plot) and GDP (PPP) (from our second plot). In order to do so, you simply modify your code to add +facet_wrap() and specify that ~measure, our key variable, should be used for facetting. This works, but you'll notice how squashed the country names are. Let's rearrange our panels. 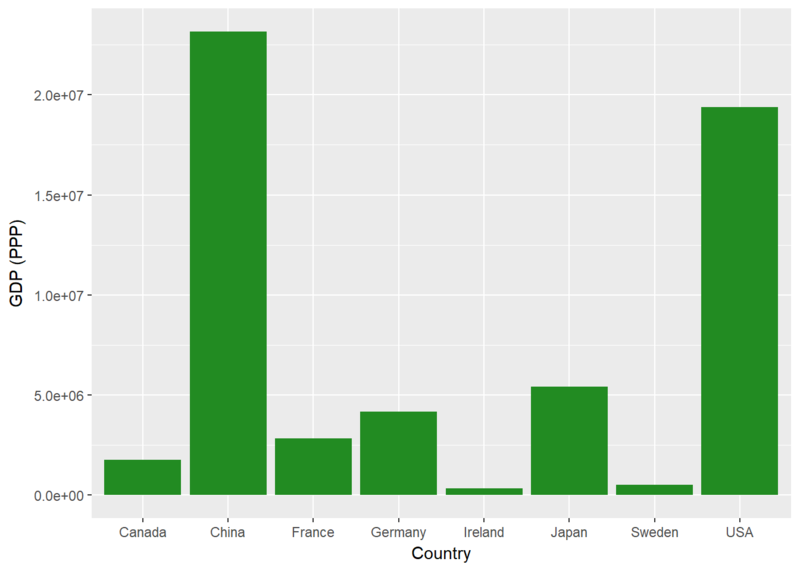 You probably notice that the countries, on the x-axis above, are arranged in alphabetical order. If you want to change this, the easiest way to do so is to set the levels of the Country factor. 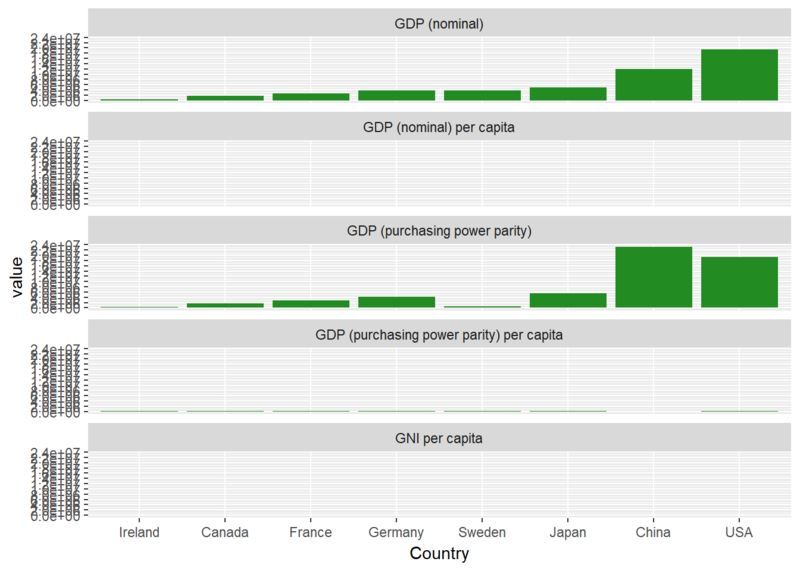 Let's perform this re-ordering, arranging the countries in order of total nominal GDP. You can also do some extra customization, like moving the facet labels to the left-hand side with the strip.position argument. You may have noticed that the facets have simple short headings, taken from the levels of the factor measure. Let's tidy this up and give our facets some nicer labels. To do this, you'll make a simple labeller function, variable_labeller, which will return the appropriate name when asked for one of the values of variable_names. Then, you pass this function to the labeller argument of facet_wrap. 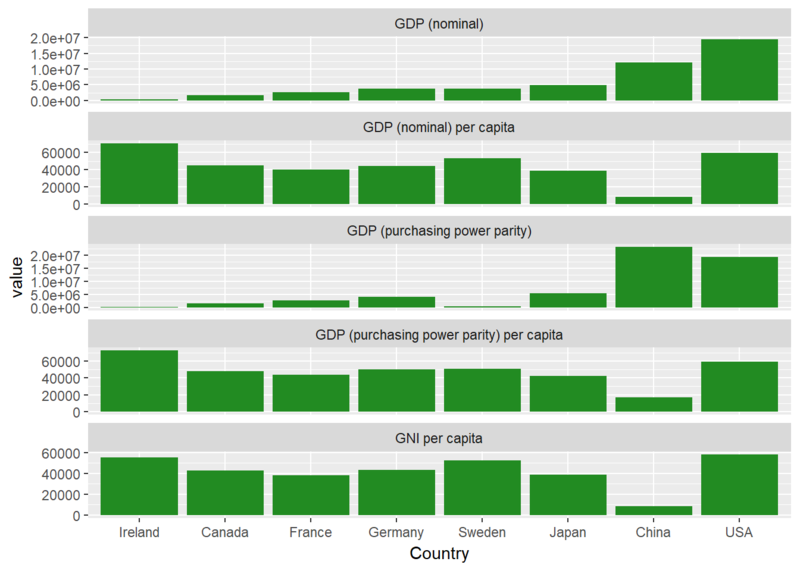 "GDP_PPP" = "GDP (purchasing power parity)"
Let's build a larger faceted plot, using each of the economic measures. "GNI_per_capita"  = "GNI per capita"
That's no good at all! You can't see the values for three of the panels. Why is that? Let's have a look at the primary data to see why. If you have a look at each column, you see that the values in each column range over a few orders of magnitude. By default, facetting will use the same limits and ranges for both the X and Y-axes. To change this, you can add this snippet to your facetting code: scales="free_y" so that each facet will use its own independent scale. This is much better. Each facet now has its own independent y-axis. However, this is a little messy, wouldn't it be nice if you could put each of the different regions in their own sub-panel? Well, with facetting, you can! Here you're going to use facet_grid instead of facet_wrap, as that will make it easy to map our facets to two variables, Region and measure, where all these two variables are spread across the rows and columns of a grid of plots. Note that you are also setting scales="free" and space="free", allowing our different panels to take up different amounts of space. You'll also need to create a new labeller function, which will produce names for both rows and labels. 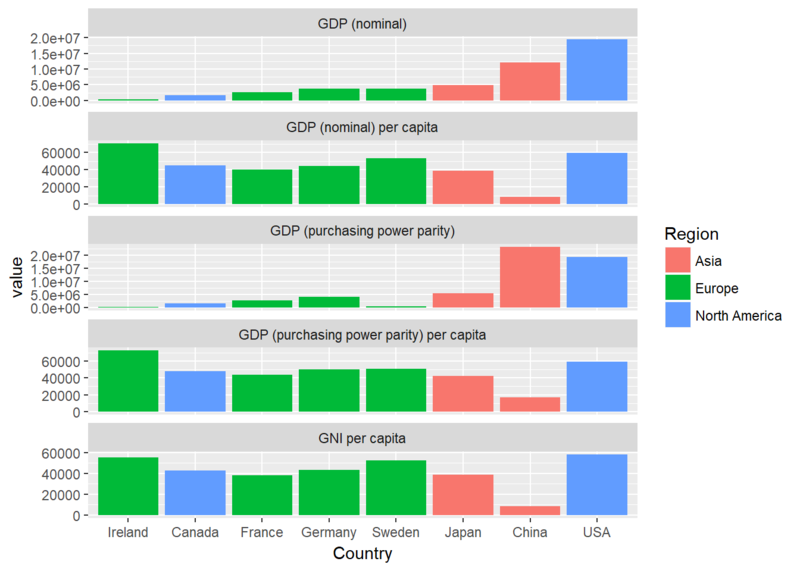 "GNI_per_capita"  = "GNI \nper capita"
Now it's much clearer! 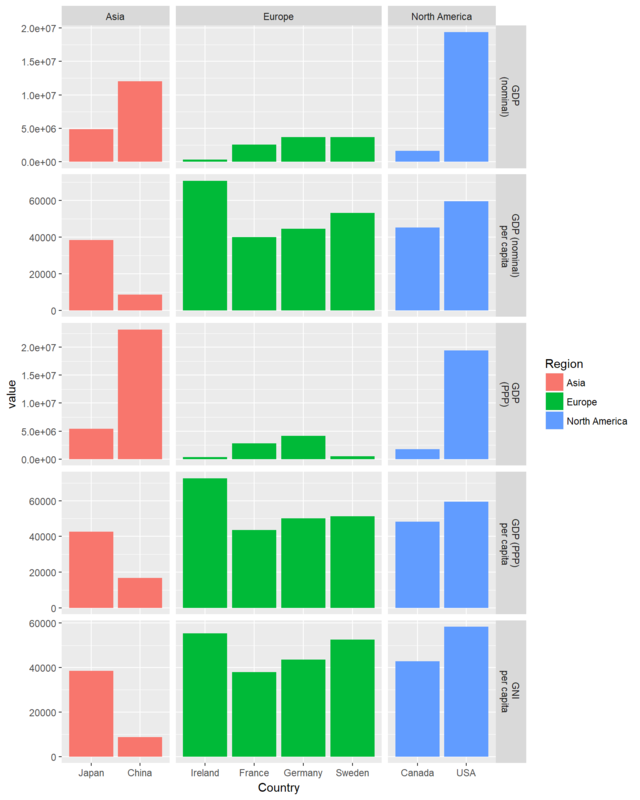 Each region has its own column of panels, and each metric has its own row of bars. That about wraps it up for this tutorial. I hope you enjoyed learning about facets. If you would like to learn more about facets, take DataCamp's Visualizing Big Data with Trelliscope course.